This beautiful Lord's Prayer 14K gold pendant is the ultimate gift to give for a baby's or child's christening, baptism, first communion, confirmation, or just because. This beautiful bible verse pendant necklace features the entire Lord's Prayer in 14K yellow gold writing on 14K yellow gold pages. 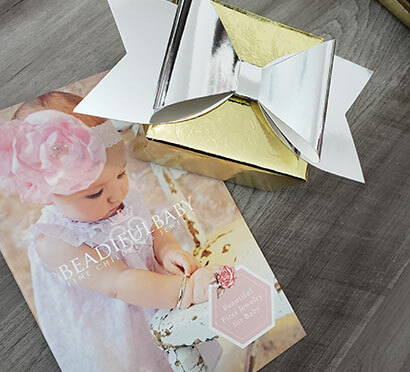 The Lord's Prayer can be easily read as she turns each page of her gorgeous keepsake. This is a gift she will want to wear always. Matthew 6:9-13 and Luke 11:2-4 contains the Lord's Prayer (i.e., Our Father Prayer) featured in this beautiful bible verse pendant. 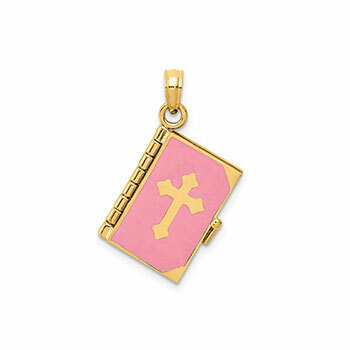 Pink enamel on front and back of bible. Also available in blue enamel. Entire Lord's Prayer Bible pendant is 14K yellow gold with a pink enamel coating on the front and back pages - all interior pages and pendant components are also 14K yellow gold. Pendant weighs approximately 3.7 grams. Lord's Prayer Bible pendant measures approximately 11mm x 22mm (0.43in x 0.87in). 14K yellow gold 14-inch 1.1mm Singapore chain included. May upgrade to a 16-inch or 18-inch 14K yellow gold 1.1mm Singapore chain for an additional charge. Step 1. Select Chain Length.